Bronchial pneumonia, also called bronchopneumonia, infects the bronchioles, the tubes leading to the lungs and the lungs themselves. Bronchial pneumonia affects millions of Americans each year, particularly the elderly and immunocompromised. Many different bacteria, viruses or fungi can cause bronchial pneumonia. Treatment depends on the severity of the disease and the agent causing the infection. 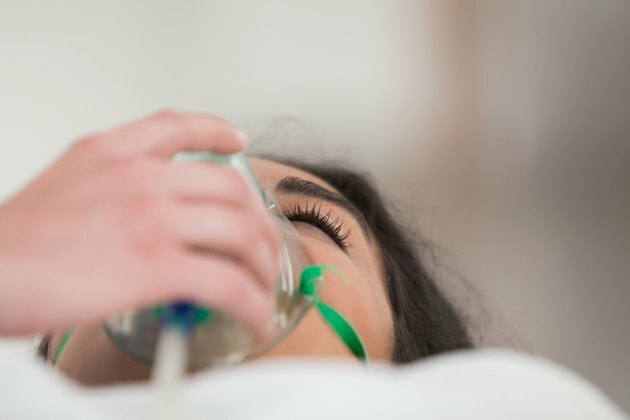 People treated at home for milder cases of bronchial pneumonia don't require supplemental oxygen, but if you are hospitalized you may require oxygen via nasal prongs or mask. Some need mechanical ventilation and help breathing with the assistance of an artificial respirator, which forces air into the lungs. Elderly people, very young people and those with existing serious diseases, such as cancer or lung disease, are most likely to require mechanical ventilation. Several methods are used to clear the lungs of secretions, and shorten the duration of bronchial pneumonia. Most can be used at home or in the hospital. Incentive spirometry, which uses a plastic gauge to encourage deep inhalation and exhalation, helps loosen the mucus in the lungs. Rhythmic breathing and coughing helps you loosen and cough up secretions by tapping on the chest, then deep breathing and coughing forcefully. Streptococcus pneumoniae bacteria most often causes community-acquired bronchial pneumonia -- affecting people not hospitalized or those with a weakened immune system. Bacterial pneumonia responds to antibiotic therapy, given orally if pneumonia is mild enough to be treated at home, and intravenously if a person needs hospitalization. A less common and mild pneumonia, Mycoplasma pneumonia, sometimes called "walking pneumonia," also responds to antibiotics, although recovery may occur slowly. Mycoplasma pneumonia may appear like a bad chest cold, and many cases never are diagnosed. Viral pneumonias don't respond to antibiotics, although antibiotics are sometimes given to prevent secondary bacterial infections. The cough associated with bronchial pneumonia, although annoying and often preventing rest, helps clear the lungs and should not be completely suppressed. The smallest dose of cough medicine possible to help you rest ensures that secretions are still removed from the lungs. Analgesics to reduce fever and help with aches and pain, and expectorants to help loosen mucus so you can cough it up, may also be given.